You knew this was coming. Don’t kid yourself. But lets be real here; kids aren’t into TRU anymore. Kids are barely into toys nowadays. My definition of a ‘kid’ since my early childhood had been little people between the ages of 4 to 14. Kids actually played with toys back then. That age range has slowly gotten smaller and smaller heading towards the younger years. Nowadays, I feel the term ‘kid’ is between 3-6, and then beyond that, we’ve got tweens and teens who now adopt a new toy that many old-school, plastic printing, major players are afraid to recognize: smart phones. The age shrinkage isn’t going to stop either as smart phones and other devices are quickly becoming the Swiss Army knife of automated babysitting for the busy modern day parents. What toy can you think of that can double as a scientific calculator and a baby rattle at the same time? Now, the deceptive ambiguous term ‘kid’ should die along with the TRU brand. If there was anything I could do to save the business, I would. It was a treasure in my childhood and it still the ‘go to’ whenever I feel the urge to scratch the toy itch. However, due to the rapid evolution of shopping in the the US, the stale, rigid processes of aging legacy business, and the ever changing interests of the youth, it was just a matter of time. With most industry people and news sources stating that this will be a loss for kids, but if you notice, it’s not the kids next to the adults that are expressing emotion, but the kids inside the adults. Modern kids don’t know TRU. Unless they have a family member that works for the company, Geoffrey the Giraffe would be nothing more than a retro meme with a damn catchy theme song that old people can sing by heart. I saw a video of a costumed Geoffrey walking into a classroom to meet a group of 6-8 year old kids. The confusion on their faces was priceless. They didn’t know who the hell Geoffrey was. How could they? With zero awareness made through any standard media modern day kids consume, this visit was more of a surprise introduction than anything else. At these kids’ age, they should have already known the theme song. If TRU was seriously important for kids, I don’t think Walmart and Target would have been such a threat. Its not like those companies are promoting any better. I do feel both Walmart and Target have a better online presence than TRU, but that’s not saying much since they are all pretty atrocious and pale in comparison to the online juggernaut. From this, I’ve learned that my idea of creating an engaging experience at a retail store might not work after all. I was a big believer that if you created an event out of a place, it would be worth it to go there. This works well with serialized magazines and media as well as competitive types activities like card games. However, if a store is simply touted as simply retail, and if you can’t sell it better than the next guy, regardless of all the bells you ring or whistles you blow, you won’t get the business. 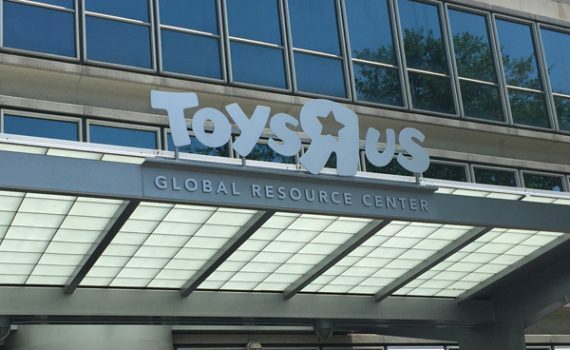 TRU needed to become the leader in toy news not only for the industry, but for the partner companies. By being the initial source, it would have made for the perfect chance to catch customers online to buy right then and there, or at least guide them to the store closest to them. I do feel they needed to reduce store especially after hearing that there were over 150 stores that were within a 15 minute drive to one another. That seems extremely excessive in this day an age. If they would have closed those stores during the first restructure over a decade ago and reinvested it into the online strategy, we could have been looking at a whole new eCommerce landscape. There is no separation between physical retail and online retail. Retail is retail. The product you get at a store will be the same product you get online. Even when a physical retail store gets an exclusive, you can best believe it’ll be online, Amazon specifically, within the first hour that the first store offers it. Scalpers know this all too well. If online retail is only a fraction of the whole revenue, boil those numbers down by how much it cost to make each dollar and I’m pretty sure you’re profiting much more via eCommerce. Plus, any lack of sales online is made up for the compounding interest of online marketing through social media promotions. The whole box opening phenomenon should have been a trend TRU invented. To look for a silver lining, I hope this will open up the doors of the long time stubborn, pretentious toy producers to partner with small business entrepreneurs without the need for a $500k yearly minimum guarantee or manditory EDI integration. Its not about selection anymore. Its about diversifying your client portfolio. If that means hiring more staff for account management and order processing, do it. Will the brand name continue to live after this? Probably as an online store for a while before just fizzling out. Just go over the list of names of ‘unforgettable’ legacy business mentioned earlier in this article, and you tell me. To me, its just water under the bridge. Toys will survive by evolving, and business will go on as usual.